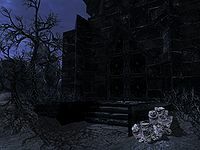 The Reaper's Lair is an enclosed ruin located in the Soul Cairn. After following the path through the large stone wall, the building is located along the southeastern edge of the area, and may be difficult to find. It is a large black ruin, similar to the other structures within the realm, but it can be distinguished by the presence of a door. The interior is very dark and barren. Lightning will occasionally strike the center of the room, illuminating the jagged walls. In the middle of the room is a pedestal where a set of Reaper Gem Fragments can be placed. Doing so will summon the Reaper and three Bonemen. After having defeated the summoned enemies, there is little to do other than loot their remains and exit the ruin. You can get around having to collect the Reaper gem fragments by scattering a few Fire Runes on the ground near him. This will summon his minions from below and draw him out for the fight. Just move to the back of the room and cast a mine on the large pile of bones. Place a rune just slightly above where the bone wall meets the bone floor on the back wall. If the Reaper dies over the grated purple circle in the middle of the floor, his corpse may fall through the grate and be unlootable. The Bonemen's corpses may be unlootable. The Reaper can be summoned by climbing the bone pile to where it joins the wall and shield bashing towards the small glowing light. This page was last modified on 2 January 2017, at 21:24.